The movie above shows you a ballerina, leaning at a fence, and the camera rotates around this scene. During the first half of the movie, the scene looks ok, but then the fence seems to reverse direction, with the ballerina “melting through” the fence. You might think that this is a just contrived movie, but the effect can also be demonstrated for real: If you cut out a distorted shape like the one on below, rotate it around it’s “middle” pole, close one eye (to cut out stereo vision), and you will observe the same (w/o ballerina, though ;). This compelling demonstration of the “Ames Window” was designed by Marcel de Heer, a psychologist/3D graphical specialist; shown here with kind permission. On his YouTube Channel you can find more striking examples. This perceptual phenomenon is a good example for the Bayesian interpretation of perception: Our brain reconstructs an “inner view” of the world on incomplete information by applying knowledge / experience: while usually correct, this can run astray if unusual situations are encountered, here the unusual shape on the right. 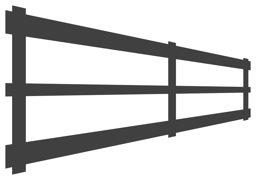 If you observe the neighbouring image, it is very difficult to actually perceive this as a flat trapezoid and not as a perspective drawing of a fence with 3 vertical poles. What is made to look a like a fence in the movie above was a rectangular window in the Ames’ demonstrations (Ittelson 1952), hence the designation “Ames Window”. It’s closely related to the well-known “Ames Room”. When the short edge of the trapezoid is far away, its shape is interpreted as a rectangle with perspective distortion. When the short edge is close to the observer, it is re-interpreted as the far-away edge (that’s why for “real” Ames Windows it’s best to close one eye to avoid clash with the stereo information). The re-interpretation of the closer short edge as the far-away edge by simple geometry leads to inverted perception of the rotation direction, inverted sense of the visible side of the fence, and consequently, the seeming melt-through of the ballerina. Ittelson WH (1952) The Ames demonstrations in perception. Princeton University Press.